AlarmManager class is used to schedule your application to be run at some point in the future. Create an Alarm Intent, specify the broadcast receiver and finally set the time when you intend to wake your app up. //TODO: For demo set after 5 seconds. Now that the AlarmManager will ensure that your app is run at a specified time, you will have to write the code to notify users in the “OnReceive()” method of the Broadcast Receiver. In this case the broadcast receiver is the AlarmReceiver – a custom class subclassed from BroadcastRecevier. The code above uses NotificationCompat.Builder and sets the WearableExtender which will ensure the notifications are also sent to the connected Android Wear device. To know more about wearable programming using Xamarin, don’t forget to check out the post on Tips for your First Wear App. You can download the full source from my GitHub repo. Have you tried embedding a YouTube video into your android app? May be you tried using the HTML to embed the YouTube player in a WebView. From a developer perspective they aren’t programmable – meaning if you wish to interact with the player like play, pause, forward, go full screen, change video quality etc from your app, there isn’t a straight way to do it. From a user perspective the experience isn’t nice and you definitely want to work a better way out. 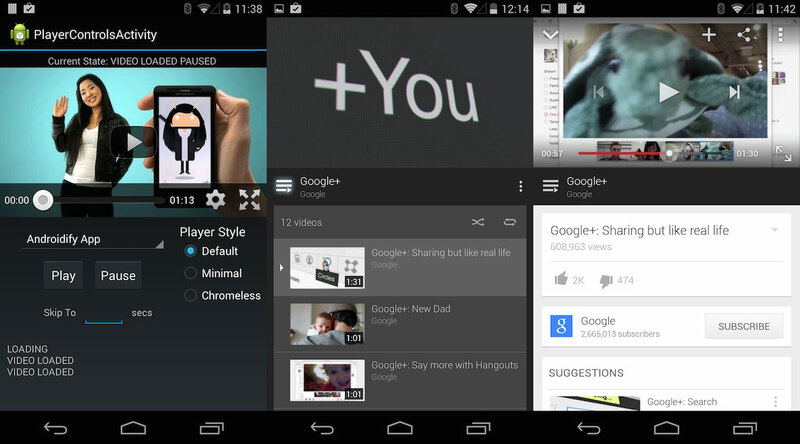 Fortunately, Google provides a slick native YouTube Player on Android platform and a player API written in Java. The player API is a set of client libraries that interacts with a service that is distributed as a part of the YouTube Android app itself. That said, you need to ensure that the YouTube App is installed in the user’s device beforehand. The advantage is – your app size does not bloat up and you can upgrade the client libraries to incorporate new changes to the YouTube app anytime. And, upgrading is not necessary if you do not care about new features or bug fixes. Lot of developers out there haven’t unleashed the full potential of the Xamarin platform yet. One of the big wins for Xamarin over any other cross-platform solutions is the power to reuse the existing Java and Obj-C (in case of iOS) libraries in C#. Apps built-in Xamarin are fully native and anything that you can do with Java in Android or Objective-C/Swift in iOS can be done in C# using Xamarin. Java ecosystem is large and it is likely that a functionality that you want in Xamarin.Android may have already been written in Java just like the YouTube Android player in this case. Technically, you will use Bindings to bring any reusable Java library to Xamarin.Android. Alternatively, you can use JNI framework or port the entire Java code to C# using an automated tools like Sharpen. In this case, I downloaded the YouTubePlayer API jar file and bound this using the Java Bindings Library project which is part of my solution. This project generates C# dll of your jar file and they are referenced into my Android project just like any other C# dll. I have plans of writing a dedicated post on bindings and you can expect that soon. For now, I suggest, you read the official documentation. The bindings project dll that is referenced into your main Android app has the full Java API in C# along with the beautiful features of C# that you can utilize – like anonymous methods, lambdas, Linq etc. The solution also includes a samples project that helps you understand each of the API features in detail. So, you can copy and paste the entire code “as is” to make it work with your app. [Update:] See how @xakpc adds async-await feature to his YouTube Thumbnail sample and unleashes the full potential of C#. If all that you care is the binding library or you are aware of how to get started with it – Head straight to my github for download. Please note: You can execute theses samples only on a physical device that has YouTube App installed. If you have an emulator that has the Google Play Services installed then it may work there too – I haven’t tested this so can’t guarantee! This sample shows how to use a YouTubePlayerView to play a video. In the onCreate() method, instantiate your YouTubePlayerView and initialize it with your DeveloperKey. To start playing your video cue the video to the player’s playlist. CueVideo method takes the YouTube video id that you want to play and loads them to your playlist. When user clicks play, well, they get played 🙂 Noticed the OnInitializationSuccess method that is overriden? I use a helper activity called YouTubeFailureRecoveryActivity as the base class for all the samples. This class handles all the failure and recovery mechanism in the Android player. Don’t forget to take a look at the PlayerControlsActivity.cs file if you want to know how to interact with the player – like play, pause, seek to position, change player style etc. 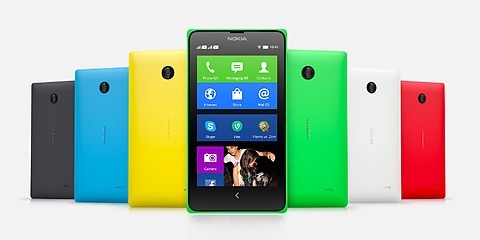 Nokia recently introduced the Nokia X family of smartphones, which provides users access to the world of Android. The good news for C# developers is that using Xamarin you can start writing apps for this platform from day 1. If you’re new to building Android apps in C#, do check out my blog post on “How I built an Android app in C# & Visual Studio in less than 24hrs” that I wrote few months back. 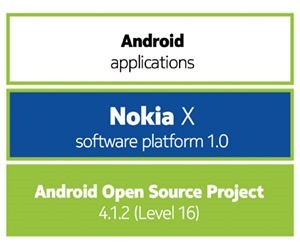 The core Nokia X platform is built on Android Open Source Project v4.1.2, which supports API level 16. That means you’ll be targeting API 16(4.1.2) for your app development. 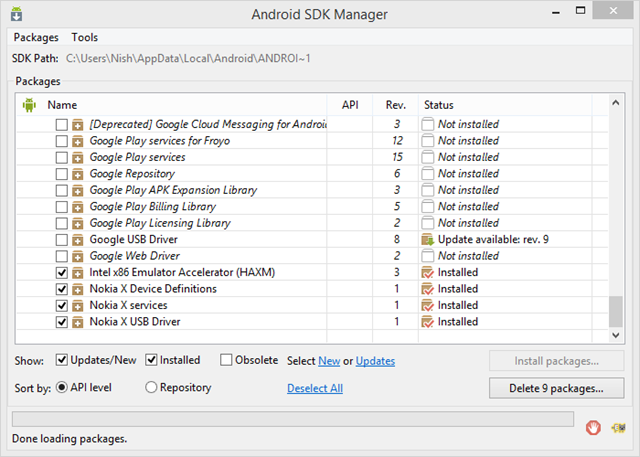 You’ll also need to install Nokia X specific packages in the Android SDK Manager. 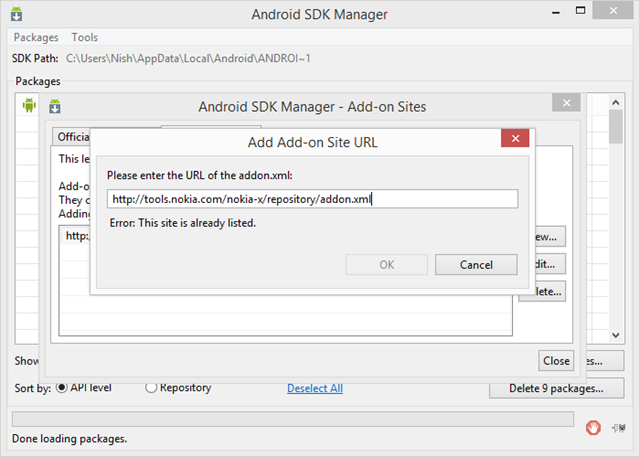 Start Android SDK Manager from Visual Studio. 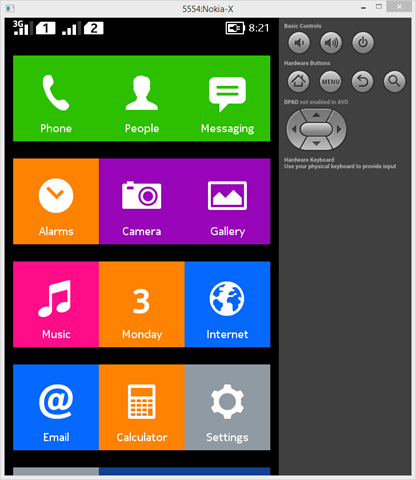 Writing your first app on Nokia X using Xamarin is as simple as creating a regular Android app in Visual Studio. In your project properties, be sure to compile your Android app with Version 16 or lower. That’s it. Go Run your first app! I had a simple code to Toast Notify with a custom message on a button click. When I ran it, I saw the message appearing on the top left corner instead of the usual Android toast. Looks like few things have changed here. 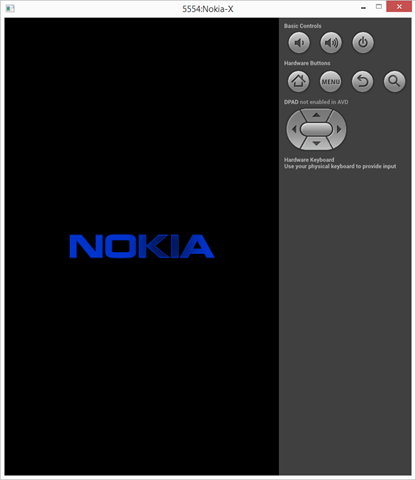 Refer Nokia X Design Guidelines for changes that you must be aware of. 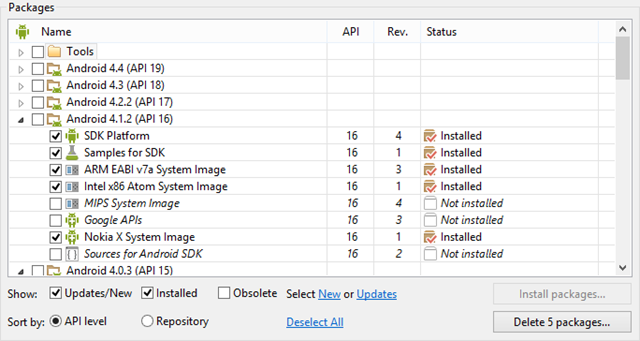 Nokia has shipped Xamarin components for their Nokia X SDK. Don’t forget to check them out at the component store. 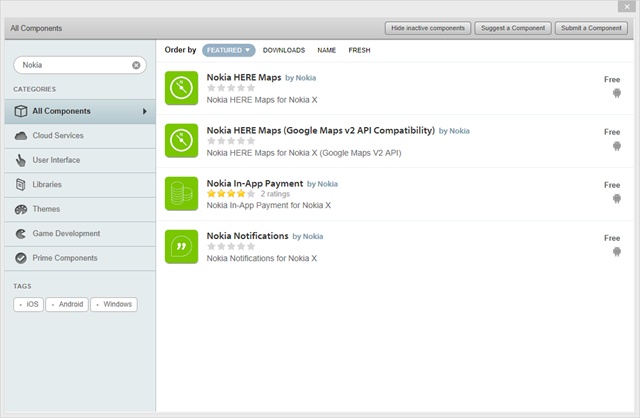 Mike Bluestein has a nice post on Nokia HERE Maps component – Use Nokia X HERE Maps with Xamarin.Android. What if you needed some extra keys for text input in your iOS app? Say for e.g. if you needed text based emoticons on top of the standard keyboard for a chat application. Thankfully UIKit allows apps to have an accessory view above the system keyboard. The area above the keyboard is an extra UIView known as Input Accessory View which you can customize to add your extra keyboard buttons. To add an accessory view, all you gotta do is, set the InputAccessoryView property of the UITextView or UITextField to an appropriate custom view. In the above code, we create a UIToolBar with UIBarButtonItems of text based emoticons and set it to the InputAccesoryView property of the SampleText. AddBarButtonText method then handles the key input events. Replace the entire keyboard (custom keyboard)? You can download the complete source code from my github repo. Yes you read that right! – I built an android app with the tools that I know – Visual Studio and in my favorite language C#. Well that’s possible because of Xamarin. In case you didn’t know – Xamarin was founded by nice engineers(Nat Friedman & Miguel de Icaza of Mono fame) who built MonoTouch and Mono for Android which are cross-platform implementations of Common Language Infrastructure (CLI) and Common Language Specifications. I love C# and it has been the language that I have been associated with all my developer life. So when I thought of developing an app for mobile, I wanted to use the tools that I know rather than go learn something new! Being a C# developer it is quite obvious for me to choose Windows Phone or Windows 8 as the mobile platform to launch my app. But wait a minute, I want them to be built on other shiny platforms too – Who’s gonna build the same app for the famous Android and iOS ? Well I want my app to be used by a million users, if not more! HTML5 based hybrid apps are an option but arguably they aren’t the best fit when it comes to User Experience – at least at the time of writing this post. Xamarin – Why I love it! Xamarin let’s you create apps in C# for iOS, Android & Mac. Period. I had a compelling reason (which I am gonna share with you later) to go write a native android app. So I decided to give Xamarin a try – downloaded the trial version and gave it a shot. And the result – a simple app called TripXpense built in less than 24hrs with no knowledge on Android platform or the way it works! Though it’s a simple app, it would have taken me weeks if I had to build it on Java. 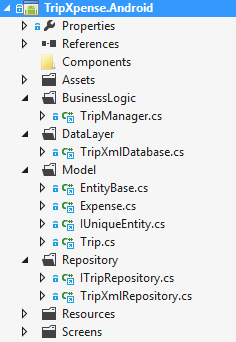 Most importantly Xamarin let’s me write in Visual Studio with my favorite plugin resharper running on it. What more can I ask? 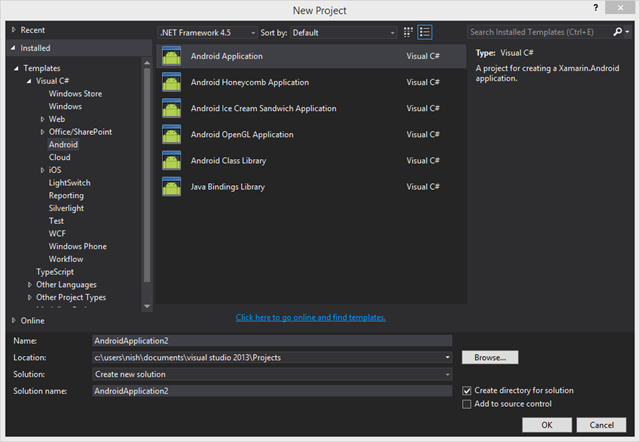 Xamarin’s Android API exposes almost 100% of the Andriod’s – that said you can build a complete android app in C#. I must mention this – Xamarin documentation is a piece of great work from their talented team! They are brilliant!! Honestly, I haven’t even visited the Android SDK Documentation for help. 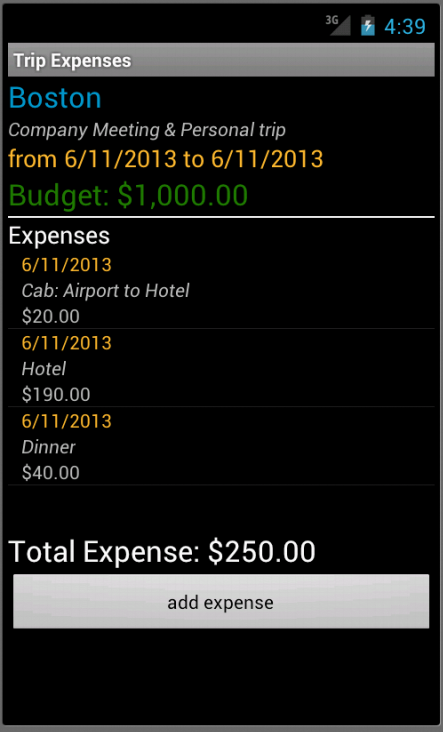 Well it’s TripXpense – a simple app that let’s you add Trips and Expenses. There are only 4 screens and there’s nothing shiny in this app yet because you know it – It’s been just 24hours of the code. If you think you can do better – go fork it from GitHub. Disclaimer: I am just sharing my experience of an Android Development on this new amazing platform that I love. That said this is no expert material. Refer Xamarin & Android documentation for patterns and right way of doing things. The code works on my PC & comes with no warranty. Few Android related stuff that you should know! This is how a project structure of an Android app will look. When you create a new Android application in Visual Studio, Xamarin set’s it up for you by default. Few things to make a note of – only a few for now. Every Android project must contain this file. The manifest lets you define the metadata of your application like Application Name, Package Name, Required Permissions, Activities etc. 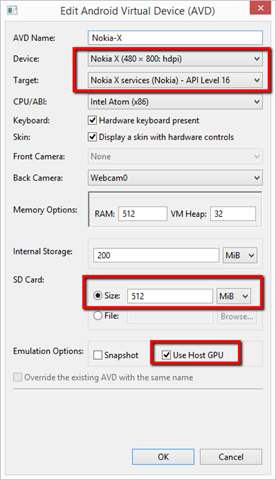 This is similar to a App.config or Web.Config files but differs in certain ways. 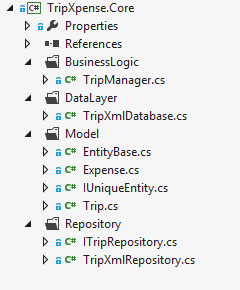 In Xamarin you can easily edit manifest information by going to the properties of the project. Please note that there are other values that are auto generated by Xamarin from the attributes that you define in classes. You can learn more about it from the documentation. It’s a good practice to keep non-code resources like images, icons, and constants external to your code. Android expects you to store them in a specific sub folders within the resources folder. 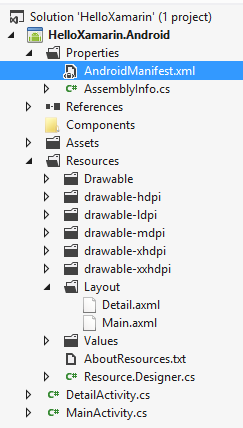 Notice 6 different Drawable folders which are kept separated based on the DPI displays. These folder will include respective sized bitmaps & PNG images. Perhaps the most powerful Resource to be noted is the Layouts. Layout is the User Interface – Yes that’s right! Whatever user sees is what is designed inside layout files. These are xml based and have the extension .axml . It decouples the presentation layer – much similar to XAML in Windows Phone. Activity is the class responsible for setting the UI content for the users to interact! You can consider this as a code-behind for the Layout written in the resources. So the activity class will contain the presentation logic of your view. 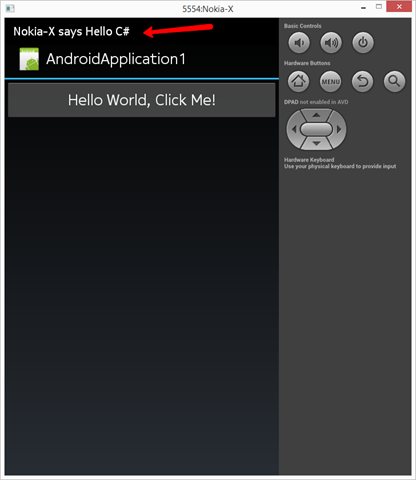 It is the class that is referenced by the Android system to do the user interaction. Activities are created or destroyed by the Android system. It’s important to understand the Activity Life Cycle to effectively handle user data in the changing states such as Running, Paused, Backgrounded & Stopped. For the TripXpense app, I am yet to implement this feature. Here’s an example of an Activity. All your Activity classes should derive from Activity base class. Notice the MainLauncher = true set in custom attribute – this is to set the starting screen of your app! Notice the SetContentView() – It places your layout on the screen. Layouts can be accessed using the static variable Resources.Layout.<yourLayoutName>. Now let’s add a Click event handler to the button placed in the Layout. Shall we? To get the reference of the button placed in the layout use the helper method FindByViewId<T>() and pass the Id of the button you set in the resource. Once you get the handle – just add the event to the Click handler. To navigate to another screen and pass some extra information along, use StartActivity() with an intent that contains the extra information. Extra information is nothing but the data that you want to pass between your screens. Now let’s look at the TripXpense app and few fundamentals of the Xamarin app Development. TripXpense – built using Xamarin! Xamarin supports cross-platform development in C# but it is not just a write once and run everywhere platform. Because one of its strengths is the ability to implement native user interfaces specifically for each platform. So when you architect your apps make sure you separate the code that is shareable across platforms. Refer Building Cross Platform applications. 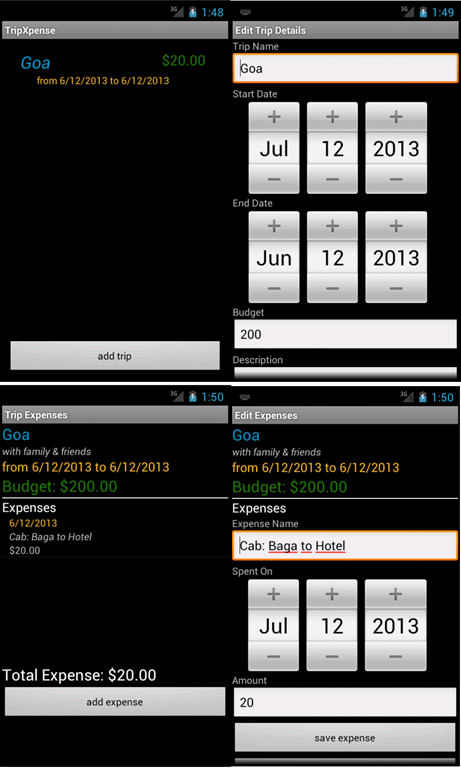 Finally I created the Screens and necessary layouts in Resources and made my app come alive. You can download this app from my GitHub repository. Go play around with it and let me know what you think! Find the links to downloads and presentation on my follow-up blog. I had a fantastic time speaking at the Tech-ed relive event organized by B.net User Group! Thanks to everyone who attended and made this fun! My special thanks to the organizers at Bdotnet – Vic, Lohith, Vinod & others for inviting me to speak here!